In this area of the Apparel Search fashion brand directory, you will find men's fashion brands from leading apparel companies and fashion designers. On this particular page, you will find information regarding men's clothing with the Sean John brand. You are welcome to utilize this section of our clothing guide to review Sean John news, Sean John blog posts, Sean John photos, and more. Please understand that you may run into a few photos or a tad of information that does not actually pertain to the men's Sean John fashion brand. Unfortunately, no search technology is absolutely perfect. We will continue to do our best to bring you as much information about the men's Sean John fashion collection as possible. Sean John is a privately held fashion lifestyle company created by music mogul Sean Combs. The line made its fashion debut with a men's sportswear collection for the spring 1999 season. Individuals of note who have represented the brand in advertising and marketing include Combs himself, musicians Nelly, T.I., Mariah Carey, Nas, Fabolous, Usher, Pharrell Williams, Mary J. Blige, Rick Ross, Mack Wilds, and Busta Rhymes, actors Lauren London, Cassie Ventura, Jamie Foxx, Penélope Cruz, Jussie Smollett, and Vincent Pastore, athlete Dwyane Wade, fashion models Tyson Beckford, Naomi Campbell, and Channing Tatum, and many notable DJs. In February 2001, Sean John produced the first nationally televised runway show during New York Fashion Week when it simultaneously aired live on E! Television and the Style Network. During fashion week in February 2002, the New York Times ran a front page story on Sean John. 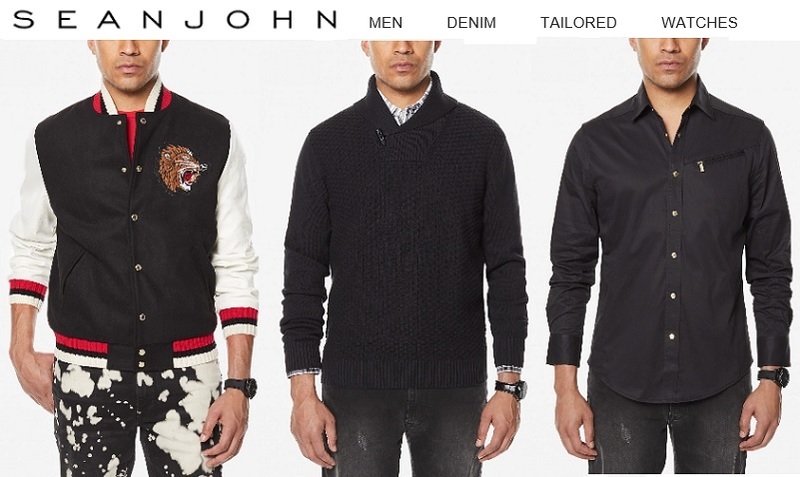 Learn more about the Sean John clothing brand for men. Did you know that in 2004, Sean John invested in the high-end label Zac Posen? Learn more about the fashion designer Zac Posen. In October 2008, the company purchased streetwear lifestyle brand Enyce from Liz Claiborne for $20 million. In May 2010, Sean John made a distribution agreement with Macy's department store in which Macy's and Macys.com would be the sole distributor of Sean John sportswear at the retail and online level. If you have changed your mind and do not wish to research the brand Sean John, you can use the search engine on this page to find another clothing label that may be of more interest. Apparel Search is a leading guide to fashion, style, clothing, glam and all things relevant to apparel. We hope that you find this Sean John page to be helpful.